Disappointing economic data from the euro zone caused the euro to fall this morning, with the news that industrial output contracted in July. Meanwhile, the dollar failed to make any significant gains against a basket of currencies, with investors nervous about the outcome of next week’s fed meeting. The pound rallied somewhat against the dollar and hit a session high against the euro after Mark Carney, the Bank of England Governor, expressed that he was comfortable with rising bond yields. Now that the imminent threat of a US attack on Syria looks quite unlikely, with the Obama administration seeking evidence that Damascus is giving up its chemical weapons arsenal, all eyes have turned to next weeks meeting of the US Federal Reserve. This is the meeting where the Fed is widely expected to begin tapering its bond-buying programme, but the speed at which it does this may be slowed by the disappointing jobs data that was released last week. The euro fell 0.15% at $1.3295, hitting a session low of $1.3283 on the release of data that showed industrial production fell 1.5% in July, well short of the 0.1% increase that was forecast. 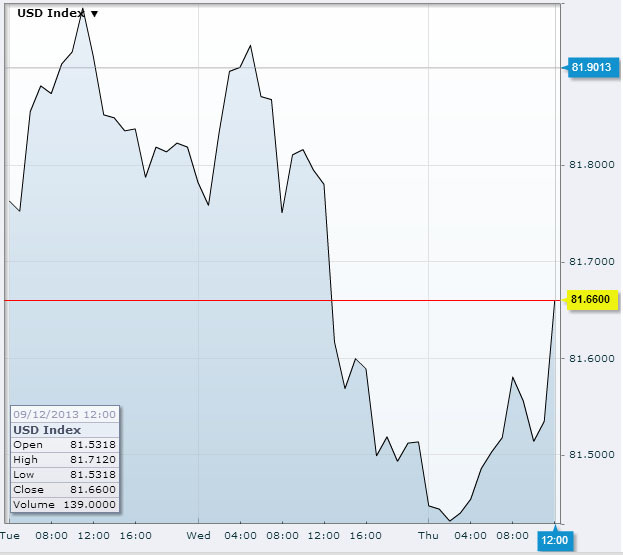 The euro fell 0.7% against the yen to 131.97, and traded near a seven and a half month low against the pound. The dollar index should have been lifted by the euro losses, but falls against other basket currencies ensured that it stayed flat around 81.524, close to a two-week low of 81.410 that it hit earlier in the session. Last Friday’s disappointing US non-farm payrolls data has made markets less expectant of an aggressive stimulus withdrawal programme by the Fed. This has caused investors to unwind long dollar positions taken in the expectation of a more dramatic cut in the monetary stimulus programme. One symptom of this was the fall in the dollar/yen pairing which fell from Wednesday’s seven-week high of 100.62 to 99,40 yen.